Having a workforce that is highly-engaged has been the “Holy Grail” of most high growth organisations, and at RHB, it is no different. While striving to engage the workforce has always been one of RHB’s priorities, it was in 2010 that RHB decided to become more focused by listing Culture and Engagement initiatives as part of its key focus areas. At RHB, engagement initiatives utilise a top-down approach whereas ideas and actions are derived via a bottom-up approach instead. It is a two-way approach where management establishes a platform for employees to provide their feedback via surveys such as the Employee Satisfaction Survey. By listening to the staff’s concerns and working together to come up with solutions, management involves the staff in putting the action plans to work. It is a collective effort from each and every employee but driven by the management team. The Human Resource division would be the strong enabler in establishing this initiative and is tasked to take the necessary steps to ensure the approaches are undertaken by the business. A highly-engaged workforce does not require an excessive amount of hard work but rather continuous effort. To better understand this concept, Azaharin recalls a saying: “A Big Shot is a Small Shot who keeps on shooting!” Do small, impactful activities continuously and you shall capture the hearts and minds of your employees. They key word in this context is “continuously”. If this is done consistently, you may be able to see behavioural change in your workforce albeit indirectly. Behavioural change on a consistent, continuous level infuses a cultural change. It is a journey; a long journey that requires a high level of patience and discipline in its execution. At RHB, we are embarking on this journey and we are instilling an acceptance of change. How do we do this? Simply by embedding in our workforce to “Think, Feel and Act” as Team RHB. 1. A regular and impactful communications plan of organisation business directions complete with challenges identified, to be initiated by leaders of the organisation. Building the sense of importance. 2. Create an atmosphere where bonding is encouraged; organise employee events/ get-together for all employees. Create a sense of belonging. 3. Build a sense of pride of the organisation through recognisable initiatives under the corporate responsibility programme and/or through sports and recreational activities. Creating employer value proposition. 4. An impromptu personal action by senior management in recognising and appreciating employees. Create a sense of caring. These four important considerations will cause any employee to be passionate about what they do; causing a ripple effect of being passionate for the organisation. At RHB, in addition to the above, we also ensure that employees are taken care of in terms of knowledge and skills development. It is all about providing employees a place to develop and learn continuously. 1. To upgrade employees knowledge and skills with the ability to provide higher productivity and be innovative at the same time. Create a structured learning programme for each role/position and level of employees. Develop a sense of importance through learning and development needs. Creating a competent/ expert of the field with a focus to innovate. 2. Provide a learning programme that is not only career-focused but also life inclusive. Create an informal learning programme that is engagement-based and close to employee’s hearts such as grooming, baking classes, health and safety talks and many more. Create a sense of caring. 3. Challenge employees’ thought processes by engaging them with experience sharing of world-renowned speakers. Be updated with the latest and greatest. Create a sense of importance. 4. While we provide learning and development programmes that focus on the “need-to-have”, we also provide specific programmes that cover the “nice-to-have” aspect. 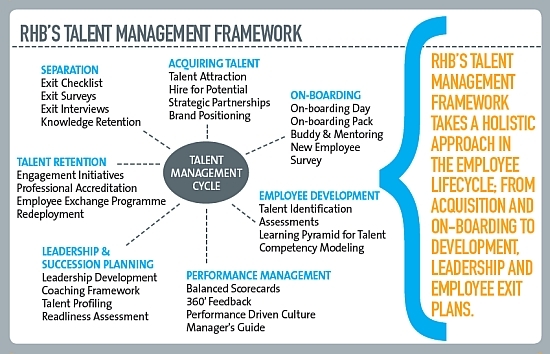 These are mainly to reward or recognise specific employees under the talent management framework. 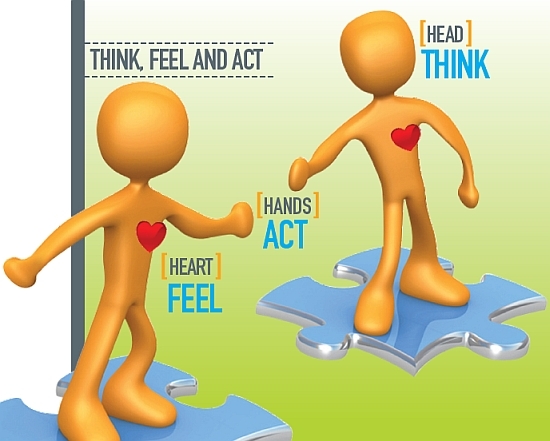 The expected end-result of what we do for the employees with regards to their Heart (Feel) and the Mind (Think) is the action or the behaviour which represents how the employee feels and thinks. In this context, RHB’s organisational core values will strengthen the drive for behavioural change. At RHB, our behaviour compass is P.R.I.D.E. which stands for Professional, Respect, Integrity, Dynamic and Excellence. It is the guiding principles of what we do and how we do it. It is about a culture change to enhance workforce engagement levels with a strong focus for high performance and high productivity. This is derived through a holistic talent management approach we have undertaken for the last two years. Whilst there may be various career opportunities in banks in Malaysia, when considering your company of choice, it is always wise to look at which companies provide an environment of development and continuous learning that ensures the growth of their employees. This module deals with leadership from the perspective of the development of self-awareness. Understanding the self at this level allows people to manage their weakness and enhance their strengths. This component of the training focusses on how to manage and motivate staff. It also deals with the character, competencies and courage of leaders, and how to lead through integrity. Leaders need to understand the business as an integrated whole. In this module, the employees are taught elements of strategic thinking and business acumen, and execute these theories during various business simulations. Engagement in this type of training creates a win-win situation for both the bank and the staff. Employees are given the opportunity to improve their knowledge base and skills, and the bank reaps the rewards of having motivated staff that are highly-trained and competent! From inception early this year to date, 350 leaders have been exposed to these programmes within the bank. When employees join an organisation, they are usually committed, enthusiastic and highly-engaged. This normally happens in the first year of employment. It is up to the organisation to come up with strategies to engage these employees to keep their enthusiasm and commitment level up constantly. Azaharin says: “At RHB, we have such strategies and I firmly believe that by using our strategies to challenge employees’ minds and to affect their hearts, RHB can engage the workforce in such a way that behaviour change becomes apparent.